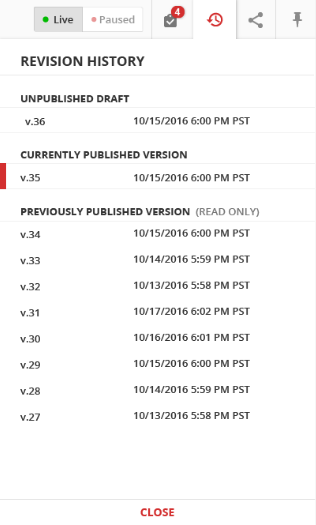 The Campaign Builder has a complete revision history, showing all prior saved versions of the Campaign. There are three sections in the Revision History, Unpublished Draft, Currently Published Version, and Previously Published Version (read only). If you have edited and not published the current Campaign Map you will have an Unpublished Draft version of the Campaign. If you have not yet changed anything on the current Campaign Map this section will be empty. The Currently Published Version is populated only when a Campaign Map is published. This means the Campaign Builder Checklist has been completed and the Map published. The Previously Published Version list will allow you to view, but not edit, prior versions of this Map. You can select these prior versions and click the Performance Mode button to see the saved statistics for that version. If you click Edit while viewing a published Campaign, and you have previously saved draft you will be taken to the last saved Unpublished Draft version for further editing. If there is no saved draft available, the published Campaign will load in Edit Mode. You can save your changes and the Campaign Builder will create a new draft version. Publish the draft version to change your published Campaign.